Apple on Tuesday refreshed its line of Mac Pro desktop computers, offering systems with up to 12 processing cores, new ATI graphics and the option for up to 512GB Solid State Drives (SSDs). The company also introduced a new 27-inch LED Cinema Display to accompany the new workhorse. The Mac Pro – which remains physically similar to its predecessors, clad in aluminum – is offered in two basic configurations that can be customized. The $2,499 system sports one 2.8GHz quad-core Intel Xeon W3430 processor with 8MB of shared L3 cache; 3GB of 1066MHz DDR3 memory, expandable to 16GB, ATI Radeon HD 5770 graphics card with 1GB of GDDR5 memory on-board, two Mini DisplayPort adapters and one dual-link DVI port, 1TB SATA hard drive, 18x SuperDrive, four PCI Express 2.0 slots, five USB 2.0 ports, four FireWire 800 ports, AirPort Extreme 802.11n, Bluetooth 2.1+EDR, Apple keyboard with numerical keypad and Magic Mouse. 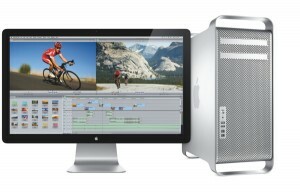 The $3,499 system sports two quad-core Intel Xeon E5620 processors with 12MB shared L3 cache and 6GB RAM. Configure-to-order options include several processor options including faster a quad-core processor, a single six-core processor and dual six-core configurations. Apple says to expect the new Mac Pro to hit stores in August. The new 27-inch LED Cinema Display features 2560 x 1440 pixel resolution, built in iSight video camera, microphone and speakers, powered USB 2.0 hub and universal MagSafe connector. It’s priced at $999. The display incorporates an “ambient light sensor” that can automatically adjust brightness depending on the light in the room. It connects to Macs using a Mini DisplayPort connector. It’s coming in September.